Bob Boze Bell's Big Bad Book of Bad Diary Entries: More Views On Why European Western Comix Don't Fly In The U.S.
More Views On Why European Western Comix Don't Fly In The U.S. I have spent the last couple weeks in France and Germany seeking out some great comix on the American West and, believe me, they have some wonderful work over here and, more importantly, they have an appreciation for our American West that is exhilarating, to say the least. 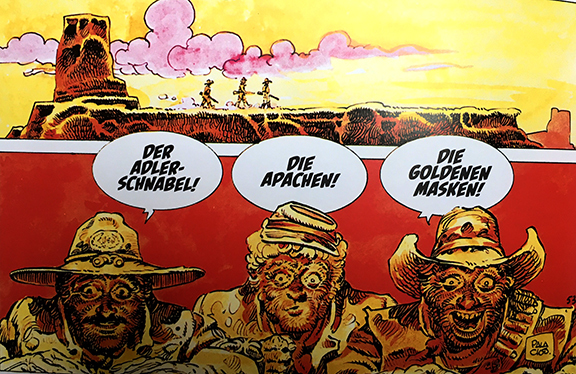 German word balloons from the graphic novel "Mac Coy"
I have asked my American history friends to weigh in on this dilemma—why don't European Graphic Novels on The American West sell in the U.S.— and I have posted comments from The Top Secret Writer, among others. Here are two more angles, the first from a film historian on all things Spaghetti Western. "I've been reading European comics and graphic novels (with the help of dictionaries I must quickly add!) such as BLUEBERRY, DURANGO, TEX WILLER, etc., for quite a long time (at least since the late 1980's) and I have asked myself the questions you are asking yourself, now, many, many times. Sure, there's the language barrier---but, that could be eliminated fairly fast if an American publisher would pick up some of these titles for release Stateside. "Frankly, I think a large element as to why is plain and simple prejudice. I've lost track of how many people in the Western history and movie buff realm that cannot stand the Spaghetti Westerns (or any of the other European Western films like the German WINNETOU series that predated the Spaghettis)---even though they really haven't seen very many. "Their thinking runs along these lines, a lot of the time: 'They were made by foreigners! How can they be good?' 'They aren't authentic!' 'They are inaccurate!' Immediate blind resistance! "And when they decry the authenticity and accuracy of these movies and comics I always have to chuckle and shake my head, because a huge chunk of these folks are rabid fans of John Wayne, Roy Rogers, Gene Autry, The Lone Ranger, and so forth. And, in my opinion, there aren't any better examples of non-accuracy than those (from a historical standpoint). But it can't be just prejudice that is stopping these publications from succeeding here. Wish I knew what it is, because I would fix it!" "As the United States we share a united mythology; What is fascinating is that in other countries all around the globe each one produces a similar cast of characters. "The defeated military hero: Custer (USA) Leonidas (Greece) Roland (France) and the powerful National figure: cowboy (USA) Knights in armor (pick your country) samurai (Japan) cossacks (Russia). "And the grim realities of war is still very fresh in Europe. Outside of 9/11 the last time our land was invaded was when Villa crossed the border into New Mexico in 1916! That those European countries had such spans of peace. "So the need for a hero of some sort is still a necessity for people today who may feel that they are losing their country/culture. Here in America one could almost feel that we are not just losing our country and culture but we are giving it away if not THROWING it away. "So the comic book, and the comic book heroes, have faded away in America. Yet now when we make movies (the 'new' comic book!) we make movies about Batman, Spiderman, and Wonder Woman. These tales do have some sense of morality I suppose.....but a cowboy is at least based in fact whereas a multi-millionaire who dresses up at night like a winged rodent and does these impossible "anti-gravity" acrobatics while battling crime does not carry the same weight because we all KNOW it is totally invented. "And the capitalistic morality of the Cartwrights (Bonanza) and the Barkleys (The Big Valley) has been rejected here at home. "Yet somehow the American West lives on as a kind of wonderworld for many people in Europe who no longer have the room or the LANDSCAPE where these morality plays can be acted out. "New Mexico is the size of Germany......but in population it is 2 million vs 80 million. We still HAVE the mythic landscape which we take for granted while those who live in Europe can only dream of. "So a comic book, with it's reliance on artwork, can still show VISUALLY this wide-open landscape where the cowboys and indians, good guys & bad guys, can act out their legends. "Germans don't want to talk about their ugly history of WWII. They would rather read stories about the American West. About the American dream. Americans want to forget their ugly history of the Indian wars. Americans have forgotten the American dream, they take it for granted." 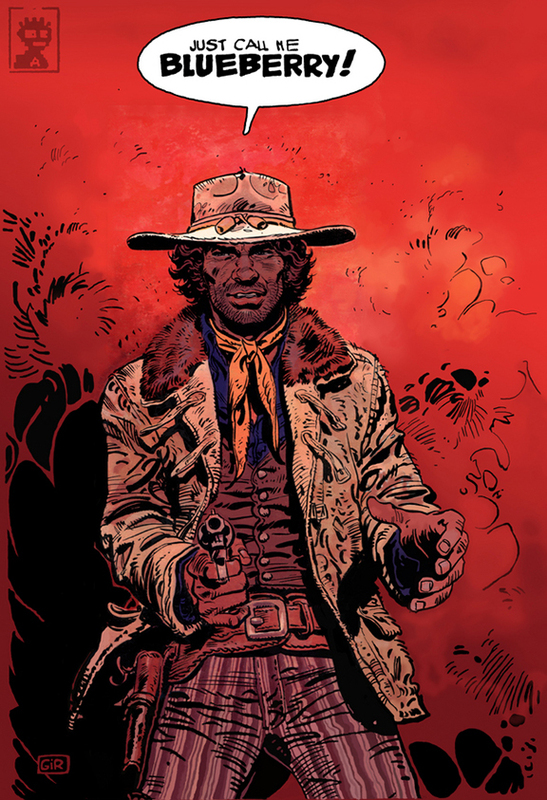 If somebody took a chance and published some Graphic Novels with a historic western theme, done well with great classic artwork...I do believe that the market would grow and thrive. (They would have their own booth at Comic-Con) Nobody is doing it because the people running the publishing houses I think just don't care.They have no imagination and just keep doing the same stuff over & over and over. I hope some smart entrepreneur will give it a go....after all, Batman was a ripoff of the Lone Ranger, and what was the original 1977 "Star Wars" but a Space Western.